BOONE – Art lovers in the High Country can always rely on the Downtown Boone First Friday Art Crawls to stimulate their senses. The upcoming Art Crawl will be made extra special with the inclusion of a giant parade down Howard Street. The first High Country Spring Procession will take place at 6 p.m. on Friday, May 5. The parade will start at the HOW Space on Howard St., across from The Local and end at the Old Boone Cemetery next to the Plemmons Student Union on the App State campus. The parade will include students and faculty from 12 ASU classes and members of more than six community organizations. ASU artist in residence Ed Woodham has been working with students and community members this semester to help organize the parade. The group has been exploring local history, culture and environmental features to give the procession a distinctly “High Country” flavor. 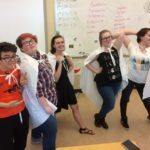 “Ed has been working with the Smith Gallery for the past six months to design a community art parade,” said Jennie Carlisle, director of the Smith Gallery at ASU. 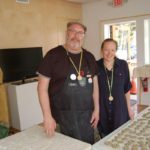 “During Ed’s visit we made 1,000 medallions for people to wear and take home as a memento from the parade. They are like a homegrown version of the beads and doubloons given away during parades like (the ones at) Mardi Gras. 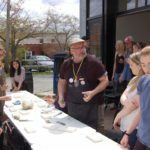 The clay used was locally sourced, and one of Bailey Arend’s ceramic’s classes at the university designed the molds,” she said. Following the parade, the public is invited to participate in a potluck dinner, to be held at the new HOW Space. In case of rain, the event will be held carnival style at HOW Space and will include hat-making and live performances. Participants in the High Country Spring Procession will include the Steely Pan Steel Drum Band, Entropy Dance Ensemble, the Boone Mennonite Choir and many more. Art students at ASU have created a number of colorful costumes and displays including a moving mountain for the parade. And the Art Haus residential community has created “cabbage lanterns” in honor of Boone’s history of sauerkraut production. 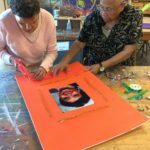 Members of the Junaluska Seniors group are making signs and placards decorated with photographs of their ancestors, many of whom are buried in the old Boone Cemetery.